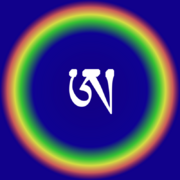 Dzogchen (or 'Great Perfection'), pronounced tsɔktɕʰẽ in the International Phonetic Alphabet, is the central teaching of the Nyingma school of Tibetan Buddhism and is considered to be the highest and most definitive path to enlightenment by this school. Many Tibetan lamas, particularly of the Nyingma and Kagyu schools, regard Dzogchen as the most profound teachings altogether elucidating the nature of non-dualism. Practicing Tibetan Buddhists consider that the state pointed to by these teachings is very difficult to describe, and can only be discovered through its transmission by an authentic Vajra Master. Dzogchen denotes the natural, primordial condition of every sentient being, including humans. In Dzogchen, self-liberation is achieved by discovering or recognizing one's own primordial mindstream and remaining in that natural state of primordial awareness in which all phenomena are experienced without creating karma through reaction, attachment, or conceptual labelling. Some teachers regard the description of this nature as a teaching completely in its own right, independent of Buddhism or Bön. Namkhai Norbu says that, as our primordial nature, Dzogchen has existed since the beginning of time and is pointed to by various masters throughout the universe. The term Dzogchen is a Tibetan rendering of the Sanskrit term maha sandhi and its variants, and is also used to render the Sanskrit term ati yoga (highest yoga); although, more properly, rDzogs-chen is a direct translation of the Sanskrit term Mahā-siddhi ('Great Perfection'). The word Dzogchen has been translated variously as 'Great Perfection', 'Great Completeness', 'Total Completeness', or 'Supercompleteness'. These terms also convey the idea that our nature as intrinsic awareness has many qualities that make it 'perfect'. These include indestructibility, incorruptible purity, non-discriminating openness, flawless clarity, profound simplicity, all-pervading presence and equality within all beings (i.e., the quality, quantity and functionality of this awareness is exactly the same in every being in the universe). It is said that the impressive personal qualities of the fully-enlightened Buddha derived from the fact that he was fully 'aligned' with this already-existing primordial nature. Descriptions of the Buddha as omniscient and omnipresent refer to his ultimate nature as this awareness. Many early masters are associated with the Buddhist Dzogchen lineage including Garab Dorje, Mañjuśrīmitra (second century B.C.E. ), Sri Singha (third century C.E. ), Padmasambhava (mid-eighth C.E. ), Vimalamitra (late eighth C.E. ), and Vairotsana (late eighth C.E). In Tibet, Padmasambhava is considered the source of the Buddhist Dzogchen teachings, which are at the heart of the Nyingma tradition. Dzogchen has also been practiced in the Kagyu lineage, beginning with Milarepa and most notably by the Third Karmapa, Rangjung Dorje. The Fifth, Thirteenth, and Fourteenth (present) Dalai Lamas are also noted Dzogchen masters, although their adoption of the practice of Dzogchen has been a source of controversy among more conservative members of the Geluk tradition. In the Bön religion, three separate Dzogchen traditions are attested and continue to be practiced: A-tri, Dzogchen (here referring narrowly to the specific lineage within Bön), and Shang Shung Nyen Gyu. All are traced back to the founder of Bön, Tonpa Shenrab Miwoche. Our ultimate nature is said to be pure, all-encompassing, primordial awareness. This 'intrinsic awareness' has no form of its own and yet is capable of perceiving, experiencing, reflecting, or expressing all form. It does so without being affected by those forms in any ultimate, permanent way. The analogy given by Dzogchen masters is that one's nature is like a mirror which reflects with complete openness but is not affected by the reflections, or a crystal ball which takes on the color of the material on which it is placed without itself being changed. When an individual is able to maintain the rdzogs chen state continually, he or she no longer experiences dukkha, or feelings of discontent, tension and anxiety in everyday life. (Compare with nirvana). Men-ngak (Sanskrit upadesha), the series of secret Oral Instructions, focusing on the practices in which one engages after gaining confidence in knowledge of the state. The interplay of these energies explain the 'thoughtform' or 'tulpa' (Tibetan: sprul pa) phenomenon, the logistics of the Trikaya doctrine, the yidam sadhana, bardo visions, Clear Light, emergence and the logistics of the doctrine of Pratītyasamutpāda, they also explain the 'play' (Sanskrit: lila of the Five Pure Lights and the arising of a 'Creation' without a Creator deity or a Prime Cause that is the particular 'view' and hallmark of Buddhism. Many practices of thödgal and yangthig work on the basis of functioning of the rolpa aspect of individual's energy. It is also the original source of the sambhogakaya deities visualized in Buddhist tantric transformational practices and of manifestations of one hundred peaceful and wrathful deities in bardo. The mind of a sentient being is also tsal energy when it is 'contaminated' by the karmic 'winds' (Tibetan: rlung). Certain practices stop the karmic winds of the body and therefore allow the energy of tsal to be experienced by itself. It is maintained that there is nothing external or separate from the individual. What appears as a world of apparently external phenomena, is the energy of the individual himself/herself. Everything that manifests in the individual's field of experience is a continuum (Sanskrit: santana; Tibetan: rgyud). This is the 'Great Perfection' that is discovered in the Dzogchen practice. In Dzogchen teachings the interdependent origination and any kind of causality is considered illusory: '(One says), "all these (configurations of events and meanings) come about and disappear according to dependent origination." But, like a burnt seed, since a nonexistent (result) does not come about from a nonexistent (cause), cause and effect do not exist. All teachings have energies that have special relationships with them. These energies are guardians of the teachings. The energies are iconographically depicted as they were perceived by yogis who had contact with them. The dharmapala most associated with Dzogchen is Ekajati. The iconographic forms were shaped by perceptions and also by the culture of those who saw the original manifestation and by the development of the tradition. However the guardians are not merely symbols. The pictures show actual beings. Dzogchen has two distinct phases to it. The first, trekchö, aims to bring about the ability to rest in emptiness, and the realization of the basic purity of all things (meaning they are free of any conceptualization, such as clean and unclean, good and bad, etc.). Sogyal Rinpoche explains that “Trekchö means cutting through delusion with fierce, direct thoroughness” (quoted in Ibid, 317). This practice is said to be the same as essence mahamudra (see Kagyü) in almost every way. The second stage is thögal (leap-over), and is almost universally said by members of all schools of Tibetan Buddhism to be “the ultimate path within Buddhism and, indeed, the highest attainment that is possible to human beings” (Ibid, 318), as it beings about full buddhahood in one lifetime. Again, little is said about these practices because “there is a great danger of misunderstanding the path, the methods and the invitation [from the guru to awaken]” (Dzogchen Ponlop, 253). Sogyal Rinpoche, Chögyal Namkhai Norbu Rinpoche and other teachers provide different practical sets of instructions (Sanskrit: sadhana) for the practice of Dzogchen. The central practice of Dzogchen teaching is Dzogchen 'contemplation,' which is rendered in English as "The View." "The View" when stabilized or unbroken, is the nondual perception of the Dzogchenpa, or Dzogchen practitioner. That is, a continuous 'contemplation' through all activity, waking and sleeping as a lived experience. According to some Dzogchenpa (in particular, Namkhai Norbu), Dzogchen is a 'practice', rather than a 'doctrine' or 'religion', and does not require the practitioner (Sanskrit: sadhaka) to be anywhere special; in fact, to be normally active while in a state of primordial or natural awareness is the ultimate practice of Dzogchen. Silent and prolonged meditation is also used to allow the obscurations (Sanskrit: kleśa) of the mind to dissipate like clouds dissolving to reveal the empty, luminous sky. Through meditation, it is possible to remove the conditioning of our bodymind (Sanskrit: namarupa) and to glimpse and work to stabilize our true nature (Sanskrit: vidya). The goal of Dzogchen practice is to remain in the clear, undeluded state of the nature of the bodymind, unconditioned by thoughts—which is not the same thing as not having any thoughts. At the beginning, a Dzogchen teacher introduces one directly to the real nature of one's bodymind, even if only for a few seconds; being a Dzogchen practitioner thus implies that one must have a qualified Dzogchen teacher, one who has mastered the nature of the mindstream. Historically, Dzogchen teachers have been very selective in choosing initiates, but current lineage holders in the Nyingma and Bön traditions have made Dzogchen teachings available to a wider (Western) audience. In both the Bön and Buddhist Dzogchen traditions, sky gazing is considered to be an important practice. Detailed instructions on the practice are provided by the Nyingma teacher Tarthang Tulku. Some exceptional practitioners (such as Padmasambhava and Vimalamitra) are held to have realized the 'Great Transferrence'. This is an advanced Phowa practice. The individual does not die at all but his or her physical body gradually disappears for an external observer. Dzogchen teachings maintain that the quality of lives of people is best when the internal elements are balanced. The body is healthy when the elements are balanced. They see the best way to balance the elements as abiding in the natural state. Dzogchen is the central teaching of the Nyingma school of Tibetan Buddhism and is considered to be the highest and most definitive path to enlightenment by this school. It denotes the natural, primordial condition of every sentient being. According to this teaching, self-liberation is achieved by discovering or recognizing one's own primordial mindstream and remaining in that natural state of primordial awareness. ↑ Damien Keown. (2003). A Dictionary of Buddhism. (Oxford University Press. ISBN 0198605609), 82. ↑ Chögyal Namkhai Norbu. The Crystal and The Way of Light: Sutra, Tantra and Dzogchen. (Snow Lion Publication, 1999). ↑ Reginald Ray. 2002. Secret of the Vajra World: the Tantric Buddhism of Tibet. (Boston, MA: Shambhala Publications,), 308-312. ↑ Frances Garrett. THDL Medicine Collections. The Tibetan & Himalayan Digital Library. Retrieved July 7, 2008. This page was last modified on 23 July 2008, at 03:33.